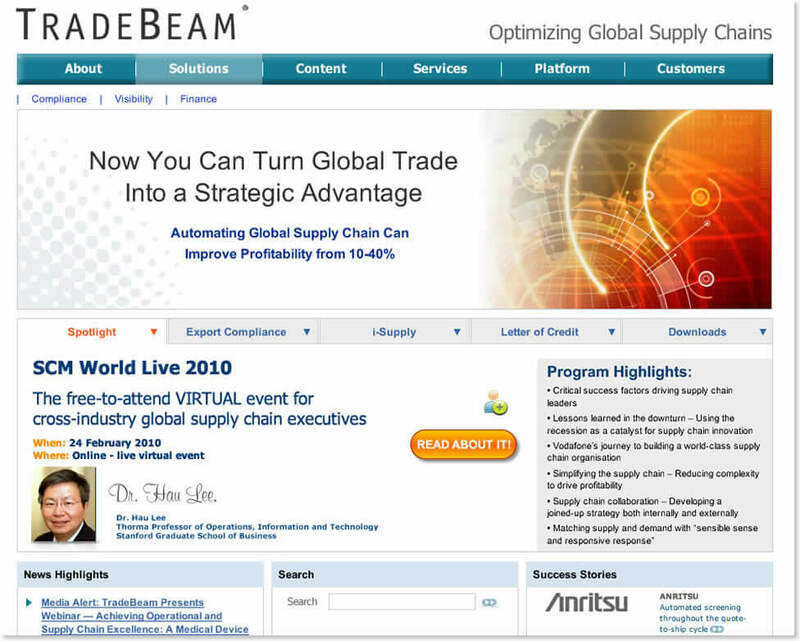 TradeBeam helps companies optimize their global supply chain through better collaboration with suppliers, supply chain partners and regulatory authorities thereby improving visibility and significantly reducing the cost and risks associated with international trade. By streamlining and automating global trade processes with minimal impact on existing systems and operations, TradeBeam’s SaaS-based software solutions help businesses compete more effectively while rapidly freeing significant working capital from the supply chain. The company’s website was under-performing and revisions were difficult to implement, but there was no budget for a complete overhaul. Everything about the old site was clunky, including navigation and promotional content. Usability testing revealed that most people didn’t understand the navigation, which was concealed in a stacked slide show. We simplified the navigation and redesigned the home page with a look and feel that showcased multiple events, speakers, whitepapers, and other news in a tabbed interface. The new design was not only a dramatic face lift, but because it was a built on a different framework, it allowed the company to more easily update information. With proper optimization, the website delivered an overnight boost of 25%. Traffic and leads continued to grow, eventually catching the eye of CDC Software, who purchased the company within a year.